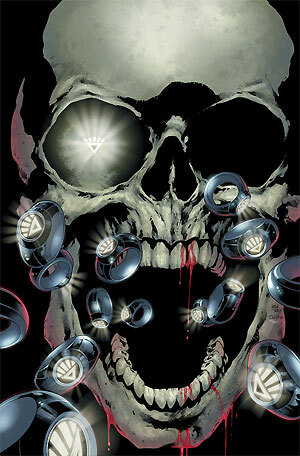 I am loving Blackest Night! While they are only on issue #2, I feel like I’ve been reading it for months. The build up in Green Lantern and Green Lantern Corps has been expertly done, and the mini-series itself is outstanding. The third issue is due out September 16 and I can’t wait! The variant cover features Black Lantern Firestorm versus the current Firestorm. Hooray for me! The only spin-off mini-series I’ve picked up so far was Blackest Night: Tales of the Corps, which I thought was quite good. The Kilowog story really stands out as top-notch. I haven’t picked up the other spin-offs primarily because I’m trying not to spend as much money on comics, and to demonstrate to DC that perhaps event books don’t need a bunch of money-sucking ancillary books. I did flip through the first issues of Blackest Night: Superman and Blackest Night: Titans. They both seemed okay, but nothing I couldn’t live without. I’ll most likely pick up the Blackest Night: JSA and Blackest Night: Flash mini-series, mostly because Geoff Johns himself is writing those. If you are interested in hearing Geoff John’s philosophy behind the series, there is a fantastic podcast on DC’s website about Blackest Night. It’s actually a recording of a San Diego Comic Con session with Geoff Johns about the series. Click here to visit the DC website, then scroll down to the Podcasts, and finally choose the “Green Lantern: Blackest Night” podcast. It’s worth your time. It ends with the entire audience reciting the Green Lantern oath (led by Johns himself)! How cool is that?!?!?! Additionally, check out the Views from the Longbox special Views from Sector 666. This podcast features my buddy Michael Bailey, along with Thomas Deja (DJ’s Comics Cavalcade and Better in the Dark). They are going to review Blackest Night issue by issue. Definitely worth your time. What about you? Are you reading it? Are you enjoying it? Anyone reading the ancillary mini-series? Are they worth the money? I too am really enjoying Blackest Night. I have not gotten any of the tie-in titles except for two issues of Green Lantern (the prologue and then the fight with GL and Flash against Martian Manhunter). Between this, Wednesday Comics, and Flash: Rebirth, this has been the “Summer of DC” for me. I’ll wait for the TPB. More than likely, they will have some crossover issues included. And, it should save me some money. Yeah, it’s pretty frickin’ good. It’s an “event” comic that makes sense, has plenty of action and is exciting to read. I don’t feel like I need a guidebook to figure out what’s going on. I have to agree with Luke that DC has put out some good stuff (or at least some very promising stuff) this summer. Checking my comics file is fun again. (b) Blackest Night: Batman made me cry. It’s good. Get it. (c) This really has been a GREAT summer to be on the DC side of the fence, and it’s going to keep going through at least January!